The Australian dollar has been swept up in the turmoil triggered by Turkey’s economic crisis, falling to an 18-month low, after fears of an all-out emerging markets crunch rippled through markets on Monday and caused a sell-off in Asian equities. The lira experienced another volatile session after plunging to a record low against the US dollar before the Turkish central bank moved to stabilise the economy and lowered reserve requirements. The bigger fear is that its monetary collapse could undermine the banking system in Europe, having already dragged the euro down. It is the latest in a series of crises from the bailout of Argentina to China’s relentless sharemarket correction that have investors searching for protection in safe-haven assets. “As the US dollar’s been rallying, the market’s now singled out emerging markets basically on one fundamental principle: the current account and whether the funding of the current account can be sustained,” said Rohan Hedley, the chief investment officer of Hayberry Investments, with a nod also to the deteriorating situation in Argentina. Turkey’s President Recep Tayyip Erdogan on the weekend; the lira’s problems deepened on Monday. Australian shares fell 0.5 per cent to 6247.6 points, Japan’s Nikkei 225 almost 2 per cent to 21,857 points and Hong Kong’s Hang Seng 1.5 per cent 27,945 points. A rush to safer assets meant the Japanese yen spiked along with the US dollar and Swiss franc. The Australian currency, which is sensitive to risk appetite, was fetching US72.88¢ later in the session and trading around levels unseen since early 2017. Shares of BHP Billiton and Rio Tinto fell more than 1 per cent to $33.31 and $74.20 on the ASX. Futures indicated a soft opening to trading on Wall Street. Steve Goldman from bond fund manager Kapstream was not confident of an easy resolution. “Turkey is experiencing the newest of today’s many geopolitical risks. The world now has a similar economic conflict beginning in Russia, while Argentina’s and Venezuela’s economic situations remain in their downward spiral and the global trade spat continues with no end in sight,” Mr Goldman said. 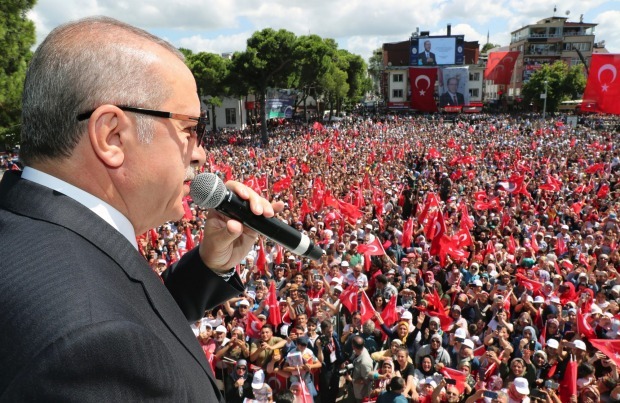 The crisis escalated with Turkey’s President Recep Tayyip Erdogan apparently limiting the ability of the central bank to raise interest rates and stem the currency collapse, while digging in on his fight with the US. Interest rates are a “tool of exploitation”, Mr Erdogan said on the weekend, and he has previously advocated for low interest rates. He is in a diplomatic dispute with US President Donald Trump over an imprisoned American pastor, causing a deterioration of the relationship between the two countries at a time when Turkey is the most fiscally vulnerable, and risking an alliance that goes back to the Cuban missile crisis. Turkey is also a NATO member. In fact, Turkey has few options beyond raising interest rates (currently at 17.75 per cent) and emphasising its strategic value to Washington. The lira fell as much as 11 per cent on Monday and 17 per cent on Friday, hitting a record low of 7.24 to the greenback. Because it is not a member of European Union, Turkey does not have a credible rescue package in place to protect its banks. However, the Central Bank’s interventions on Monday will free up 10 billion lira, $US6 billion of US dollar cash, and $US3 billion of gold liquidity to benefit the financial system. “The Central Bank will closely monitor the market depth and price formations, and take all necessary measures to maintain financial stability, if deemed necessary,” it said on Monday. Gold futures fell 0.4 per cent to $US1,205.71, resisting the pull of safe-haven buying. “I think the big lesson learned [post-Asian crisis] was countries cannot run big current account deficits, big budget deficits and maintain little reserves. Some countries have learned those lessons, and those countries are much better insulated against this contagion and current sell-off in emerging markets,” Mr Goldman said. “Any American response punishing Turkey would be viewed positively by Trump’s base of supporters, making economic sanctions an easy win for Trump’s poll numbers. While Turkey can threaten ending military co-operation in the region, it’s a tough battle to win when you’ve issued so much foreign debt, continue to run current account deficits, have little reserves, spiralling inflation and now have the market question whether your central bank is even independent. The South African rand and the Mexican peso were notably weaker, and the Australian dollar against the yen was one of the worst performing currency pairs.